[Update] The JotForm app for Weebly helps you manage and add your forms to your Weebly website in a few clicks. Read more. 1. 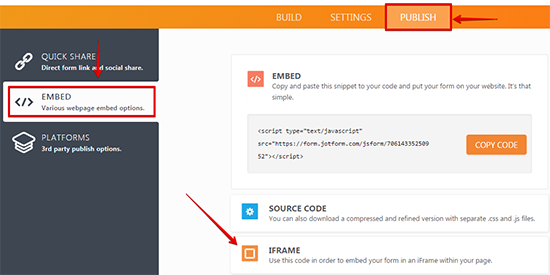 Get the iFrame Embed code of the form. Click the "Publish" option in the top menu. Go to the "Embed" section and then click the "iFrame" option. 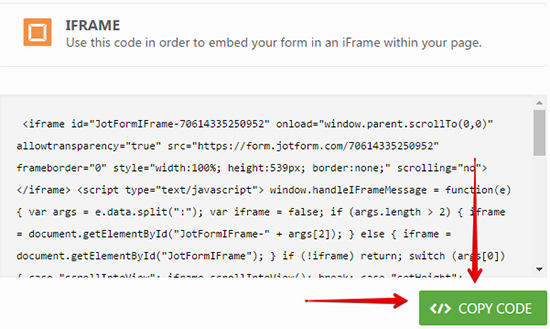 Click the "Copy Code" button to get the iFrame code. 2. Open your site using Weebly's Site Editor. 3. Add a "Custom HTML" element to the desired page on your site. 4. Paste your form's embed codes in the "Custom HTML" area. 5. Click the Publish button to save the changes made to your site. In my weely website, the form is not getting integrated. I have copied and pasted all the source codes, iframe etc but nothing seems to work. I have read your troubleshooting and I am still getting the Imcomplete Values even though I fill out all of the form. Any suggestions? Can I make this a pop up light box instead so that people have to click it before seeing the page? I have an existing form on a weebly site and I have added the embedded codes from your website to the form. It appears and functions as it should but the information collected doesn't show in my email, only the weebly created fields show. Is there any way I can make the two work together or do i have to stick with one. The form looks good on my weebly site (desktop computer version), but doesn't seem to fit right on mobile. Is there anything I can do to optimize the form for mobile? Is there a way to publish the link to the form as an extension of my website, without embedding it into the weebly website? In essence can the form be something along the lines of www.google.com/joingoogle. WIthout having a 'join google' page on my website? COuld you advise which forms are compatible with weebly websites? Form does not send email alert on submission. Why?? How to change the Facebook Tab Title?